The Transatlantic Sessions have become something of an institution and this was the 9th annual event at London’s Royal Festival Hall, tickets for which sold out well in advance. The house band led by fiddle maestro Aly Bain and dobro legend Jerry Douglas are a wonder to behold, master musicians all. You seldom hear such a talented consortium and the Transatlantic project is one that unites the Celtic and Americana genres, builds on the synergies between them and spotlights musicians from America, Scotland and Ireland. The 11-strong house band kicked off with a rousing folk number whilst the five guest acts sat on sofas at the back of the Festival Hall stage. A slightly surreal setup but it gave the stage a cozy feel, more like a club. The five guests took it in turns to perform, playing one or two numbers at a time. They were two solo American country singers, Shawn Camp and Suzy Bogguss, two traditional British folk singers, the brilliant vocalist Julie Fowlis from Uist and Daoiri Farrell with his Irish bazouki, and the Americana duo The Secret Sisters. Bookending the two sets was the house band, playing a selection of folk reels, one of which “maybe went a little faster than we wanted it to” and numbers featuring different band personnel. Shawn Camp, the multi-instrumentalist from Arkansas was in the UK for the first time and performed tracks including The Grandpa That I Know, seemingly very much at home in London and very relaxed. Suzy Boguss played Merle Haggard’s Let’s Chase Each Other Around The Room and and a lovely version of Ian Tyson’s Someday Soon. The Secret Sisters, Laura and Lydia Rogers, came on stage and immediately the patter began, the stories, the jokes. Lydia introduced the number He’s Fine and had the audience in giggles by saying her songs were mainly about romantic experiences going wrong. “And this one is about my most terrible romantic experience. It’s about this ‘lovely’ guy in Nashville who is now married to a poor girl that we should all pray for. There’s a radio show in Nashville, his favourite show, that plays this tune on rotation.” The girls’ harmonies were impeccable as always. Lydia said: “We play what we call depressing music. Next is a murder ballad and this happy little number is called Mississippi.” This was beautifully performed and the band accompaniment was perfect. 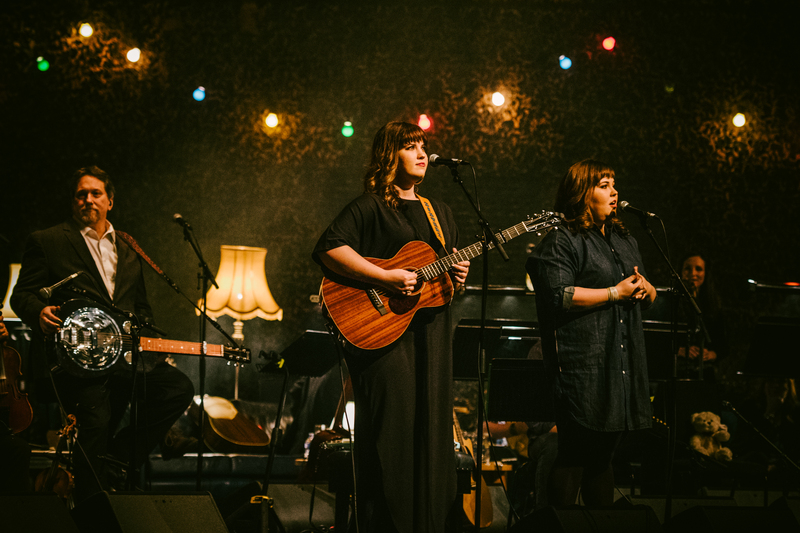 The girls sumptuous trademark harmonies filled the Festival Hall. The Sisters came back to lead the encore with Tennessee River Runs Low from their Grammy nominated album You Don’t Own Me Anymore and sent everybody home happy. This was an enjoyable and stimulating evening with the opportunity to see five acts interacting with the superb house band. Credit should go to the musical directors Aly Bain and Jerry Douglas for putting on a fine show.